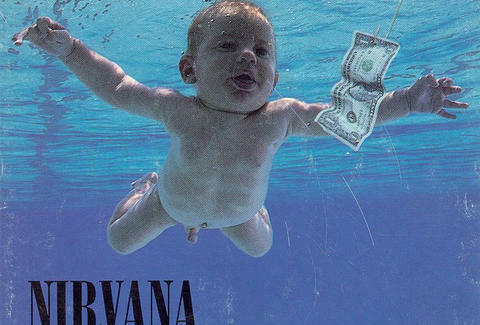 Nirvana’s 1994 album Nevermind -- which changed rock 'n’ roll and sold 30 million copies worldwide and a bunch of other stuff -- featured on its cover a naked baby swimming in a pool, chasing after a dollar attached to a fishing line. As far as album covers go, it's instantly recognizable. That naked baby is now a fully clothed man named Spencer Elden, and last Saturday he recreated the iconic photo for the album’s 25th anniversary. Elden originally asked the photographer if he could jump in the pool sans undergarments, to better simulate his original nakedness. He was told to keep his pants on. “I said to the photographer, ‘Let’s do it naked.’ But he thought that would be weird, so I wore my swim shorts,” Elden told the New York Post. Nonetheless, Elden, who has “Nevermind” tattooed across his chest, shared some thoughts about being a really famous baby. “The anniversary means something to me. It’s strange that I did this for five minutes when I was 4 months old and it became this really iconic image,” he told the newspaper. Although rights to the original photo -- which was taken by photographer Kirk Weddle in 1991 -- no doubt come at a premium, Elden was down to recreate the image for $200. The Post notes that Weddle paid Elden’s parents $200 for the original photo 25 years ago.